I spent part of the night, and a little of the morning, figuring out how to apply depth of field in practice. With a little Dr. Pepper in my system, some music on my iPhone 4, and a little bit of experimenting I came up with some quick ideas for testing out the depth of field concept. Using a SMC Pentax-M 1:2 50mm lens as a basis for experimenting. 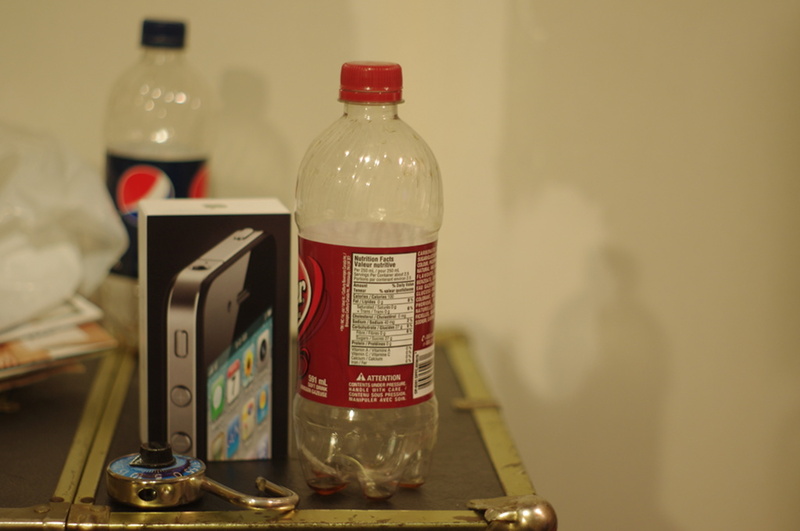 I came up with this frame featuring the bottle of Dr. Pepper I drank earlier, the box for my iPhone 4, a bottle of Pepsi, and a combo lock. To give you a little idea of the objects depth in the photo the iPhone box is placed approximately 1.5 inches behind the bottle of Dr. Pepper and 1 inch from the back of the combo lock. The front most tip of the Dr. Pepper bottle and combo lock sit within a quarter of an inch from the copper trim of the trunk they sit on. The SMC Pentax-M 1:2 50mm lens is the fully manual lens that I use mainly on my Pentax K1000 camera, but in this case I was using it on my K-x. In this shot the F stop is at its lowest setting which is 2 and the focal distance, distance from lens not focal length, was dialled in at around 2.5 feet. Experimenting with this lens has also made me aware that the K-x indicates when an image is in focus even with manual lens. I was originally under the understanding that this was only the case with Auto-Focus lenses.